An exceptional education made more accessible. Darlington School believes that the promise and potential of a student is unrelated to financial background. Between need-based financial aid, merit scholarships, the Georgia GOAL Scholarship Program, our Alumni Legacy Award, and our payment plans, we are committed to making educational opportunities available and affordable to as many academically qualified students as possible. If you want to be here, we try to do everything we can to help. Financial aid helps close the gap between tuition and a family’s ability to pay, as determined by the School and Student Services (SSS). Click here to learn how to apply for financial aid. 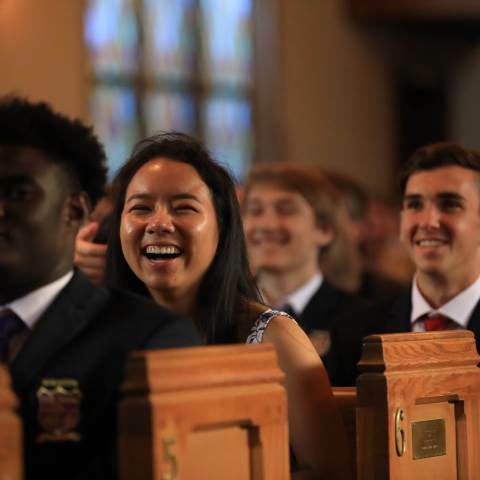 Thanks to the generosity of our alumni and friends, Darlington has a number of merit scholarships available to new day and domestic boarding applicants each year. Contact our admission team to learn more. The Georgia GOAL Scholarship Program provides partial tuition scholarships to Georgia students who want to attend private K-12 schools. To qualify, students must be enrolling in pre-K or kindergarten or transferring to Darlington from a public school. Our alumni are our greatest asset, and there is nothing that makes us more proud than when graduates choose Darlington for their children. If you are an alum who is considering Darlington for your child, please ask about our Alumni Legacy Award. "As a single mom, the vision and dream of sending my children to private school to better achieve the dreams I had for them seemed so out of reach. Darlington’s Financial aid department put us first and proved to us that we mattered and that we weren’t just another number. Because of them, I am able to achieve the dreams I have for my third-grader as well as her sister. Because of them, this opportunity for my children is possible." "Our son is currently receiving a scholarship and financial aid. The generosity of the Darlington Community of alumni and donors has made our son's educational experience possible. We are truly grateful to Darlington for the gift of our child’s education." "Darlington has changed my life and given me better opportunities to expand my knowledge and learning. I have made lifelong connections here." "I am so thankful to my scholarship donors for all they have done to help me have this wonderful education." To learn more about how we can help make Darlington School more affordable for your family, please contact Carolyn Brearley ('99), director of financial aid and director of GOAL.